Warsaw—a city of contrast and colour, from the UNESCO listed centre of the old town, to the sprawling new construction, this is truly a place that evokes a sense of history, heritage, and renewal. Located on the Vistula River in east-central Poland, the area is the 10th most populous city in the European Union, and boasts many interesting attractions. Although Warsaw is a fairly young city, the place has seen its fair share of destruction. During WWII, the entire city was ravaged, and many architectural monuments were obliterated. However, the Old Town quarter has been reconstructed, and now each district is replete with an interesting vibe and ambience to discover. 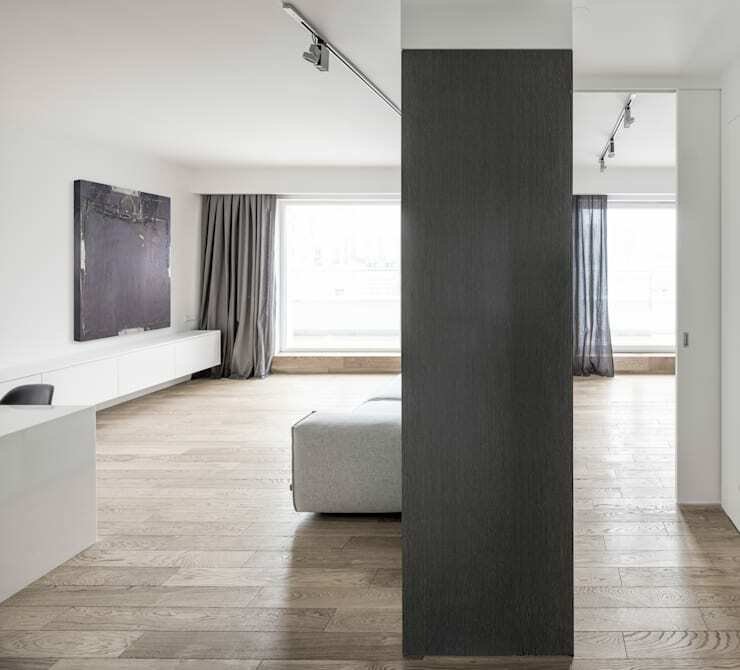 Today on homify we are taking a look at one of Warsaw's most stylish apartments. 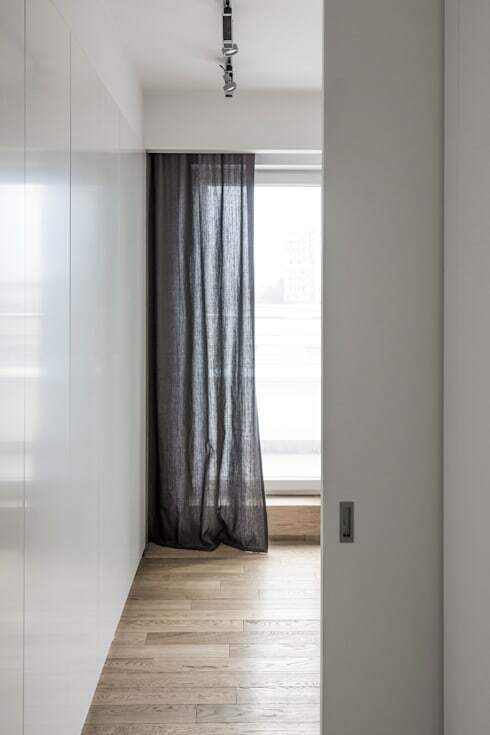 Located in the city, the home's interior has been designed by OneByNine, a multi-disciplinary architectural studio with offices in both Poland and Hong Kong. Designed by architects Ewa Kote and Łukasz Wawrzeńczyk, this dwelling is sleek, chic, and ultra-contemporary. To take a tour of this stunning dwelling, check out the images below, and get some minimalist inspiration for your home. 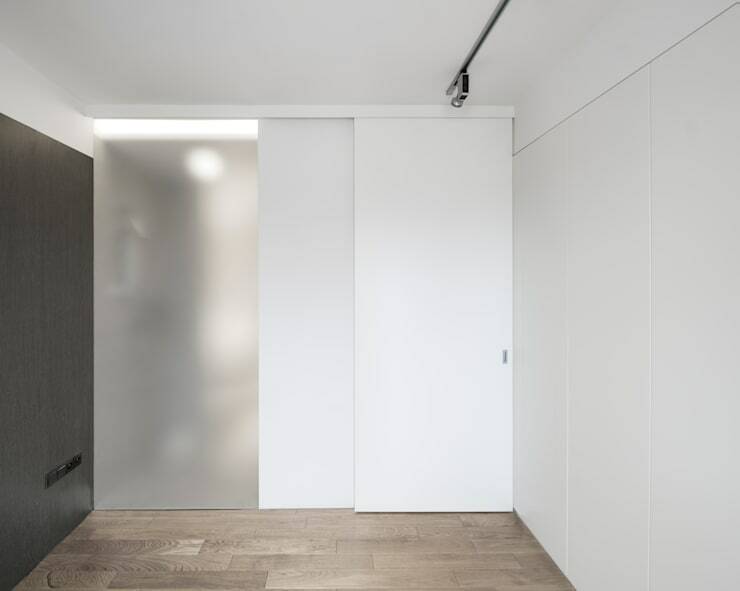 The apartment has a compact internal area of only 42m² and because of this the architects and designers have employed a minimalist scheme throughout. Here in this image we see the kitchen and dining space. The result of the minimalism in this area is a space that feel surprisingly spacious and enjoyable. 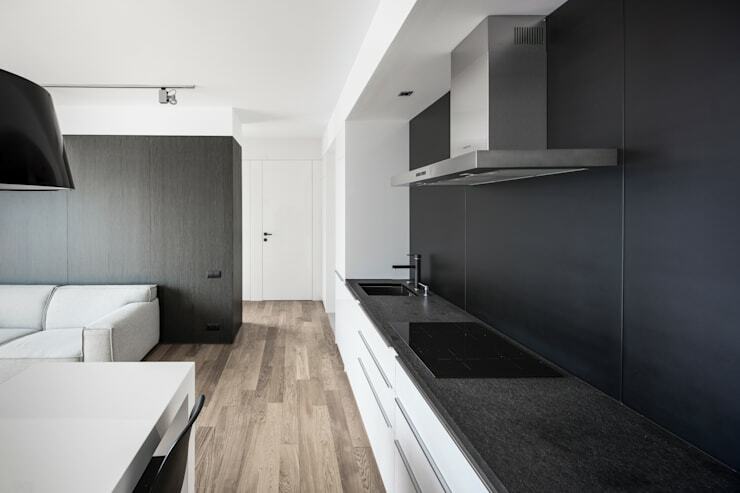 The room is airy and light, with a timber floor, white walls, and black features. The black and white palette that has been employed evokes a yin and yang aesthetic, presenting an equality and harmony within the living zones. Looking at the room from another perspective, we are able to see the bold features that have been implemented to create interest and intrigue within the spaces. Here the built-in dining table functions as a secondary preparation space for the kitchen, and serves as a multi-purpose kitchen area, and stylish eating place. 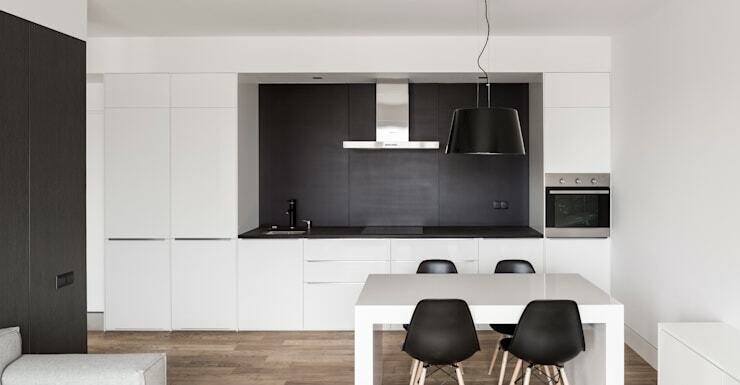 The table is white, as is the joinery, while the bench tops are black, and the surrounding splashback is also black. 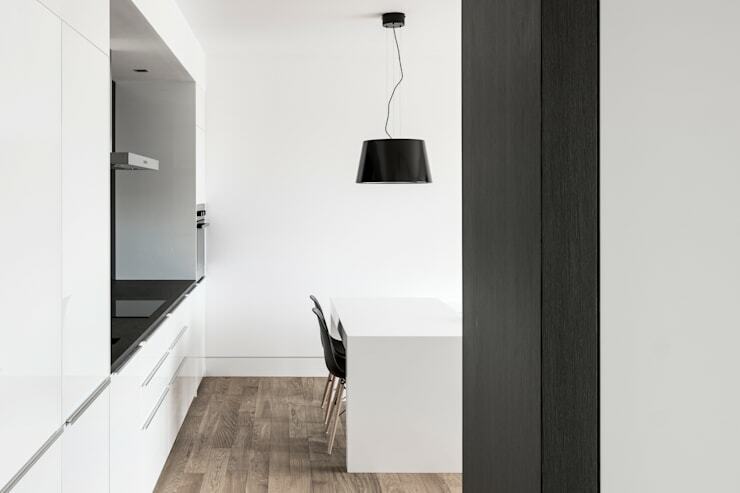 The stand out element within this room is most definitely the kitchen, with its sleek lines. However the light fitting that hangs above the dining table is a notable inclusion, bringing originality and character to the stark space. Although the home is only compact, the areas and living zones have been wonderfully designed to feel light, airy, and open. As we take a peek at the bathroom door from within the kitchen space, we are able to fully grasp the minimalist aesthetic, and clean ambience. The kitchen boasts hues that match with the timber veneer panelling upon the other interior walls, while slick stainless steel appliances add luxury and high-tech appeal. There is a flow between the interior areas due to the open plan design and layout of the apartment. This evokes a contemporary feel within the home, and works to increase the sense of space. Again changing our perspective we are given a totally different view of the dwelling. From here we see the central dividing wall, which separates the living area from the bedroom. Although this home is only sparsely furnished, you can truly get an idea of how it will feel when completed finished. The dark timber veneer wall in the centre of the house acts as a feature as much as it does a practical room divider. To the left hand side of the space we get a glimpse of the bespoke entertainment and media centre. Above this, there is a piece of contemporary art that adds interest, and coordinates with the general colour scheme of the home. Curtains are heavy and can block out the daylight when necessary. To the right we see the bedroom with sheer curtains, and the timber floorboards that have been continued throughout the dwelling. Track lighting is versatile, and can be changed according to the desired illumination within the room. The bathroom is simple, sophisticated, and ultra-practical. 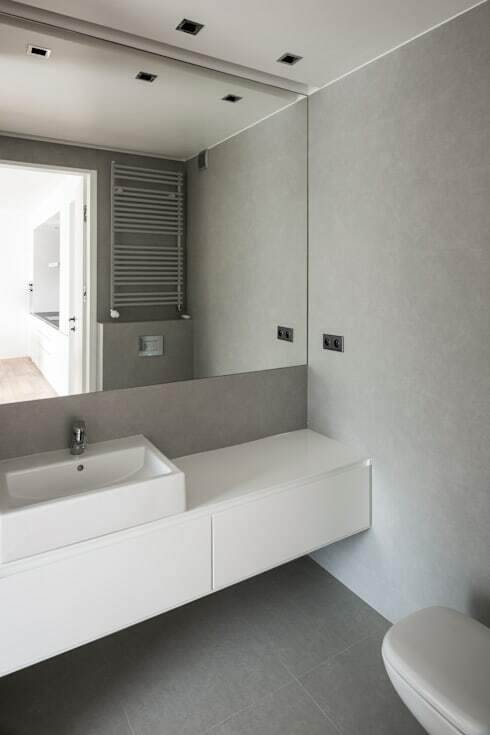 Here we see the basin and vanity that has hidden storage within, while the wall boasts a huge piece of mirror. On the opposite wall we see the kitchen in the reflection of the mirror, and also a heated towel rail, perfect for those frosty Warsaw mornings. The fittings are all chrome, and the power sockets are also in a silver tone. Spot downlights are recessed into the ceiling, and provide ample illumination for the wash room. The bedroom opens up with sliding doors, and these are situated on a track which allows either side to open up. On the left we see a frosted and glazed panel, while there are two other white sliding panels. A dark feature wall adds interest within the sleeping quarters, and ensure the atmosphere is unique, as well as not simply an all-white room. If you like this design, and want to emulate a similar aesthetic into your home, chat to a professional, and make your dreams a reality. Finally we take a closer look at the bedroom, and are able to sneak a view of the gorgeous sheer curtains. They are designed in a grey/charcoal hue, and looks beautiful against the white walls, and timber flooring. Gigantic floor to ceiling glazing brings an abundance of light into the room, and this helps to create a sense of space within the compact bedroom. The home is a wonderful demonstration of what can be achieved with a concerted 'less is more' attitude, and a design that maximises spaciousness with bright colour schemes and plentiful glazing. Would you like to live in this home? Let us know if the design inspired you in the comments below!